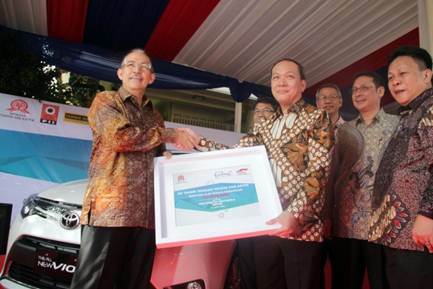 JAKARTA - University of Indonesia became one of the universities who received a car unit as a teaching aid donation from Toyota and Astra Foundation (YTA). The handover was held at April 22nd, 2015. Beside University of Indonesia, in the same day State Polytechnic of Jakarta was also received a unit of car as a teaching aid. By the donation, YTA expects the students could understand more about advance automotive technology. Therefore, the students which are the young generation and would be the nation's future leader, could be have more competitiveness when entering the industry. As its contribution to education, not only donated the teaching aid, YTA also conducted general lecture for the students of faculty of engineering. "College Student Facing the Future: to be a Global Scale Engineers" with Mr. Edward Otto Kanter, the Director of PT. Toyota Motor Manufacturing Indonesia as the key speaker. Very inspiring!